As with all preschool games, dominos should be introduced to the class and then students should have the opportunity to play with and explore the pieces. Gather the children together and show them a set of dominoes. Ask them to form a circle. In the middle set up the dominoes to form a chain reaction. Place them upright and close together. Ask the students what they think will happen if you touch the first domino. After hearing their predictions tap the first domino and start the chain reaction. The students will love to see this and will be eager to try their own. Set them up in small groups with a box of dominoes for each group. Encourage the children to experiment. Ask them questions: Can you make your domino walls in an “S” shape? What happens if the dominoes are too far apart? Will it work if you stand them on their sides? After the children have had ample opportunity to investigate the dominoes gather them together and show them a set of large dominoes. (Make these by using the template, copying it and adding your own dots to make a set. Copy onto thin cardboard and laminate for student use.) Ask the students to tell what they see (dots). Ask them to show you which dominoes have the same number of dots on each part, which dominoes have more on one part than the other and so on. Count the dots on each piece. Tell the students that you are going to show them something other than building that can be done with the dominoes. Share the book Domino Addition by Lynette Long. This book introduces counting and addition from zero to twelve in a very simple form. All preschoolers will not understand this concept but it will show them that domino dots can be used as a counting aid. Domino sets can be purchased at Dollar or novelty stores inexpensively, or use this template to make your own sets. This provides an opportunity to use different colors for the dots. For instance you could make all the “one” dots red, all the “two” dots blue and so on. Share the book What Comes in 2’s, 3’s, & 4,s? by Suzanne Aker. Suggest that each child look at the person next to them and look at their two eyes, two ears, two arms, two hands, two legs and two feet. Have available sets of dominoes and ask everyone to hold up a domino showing two dots on one part. Repeat this with threes and fours after looking at the pictures and discussing what they see. Using the large dominoes as a demonstration set show the class how to put one domino down and then find a match for either end. Explain to them that you will now show them how to play a game of dominoes. Demonstrate a simple domino game with players taking turns to match either end of the line. 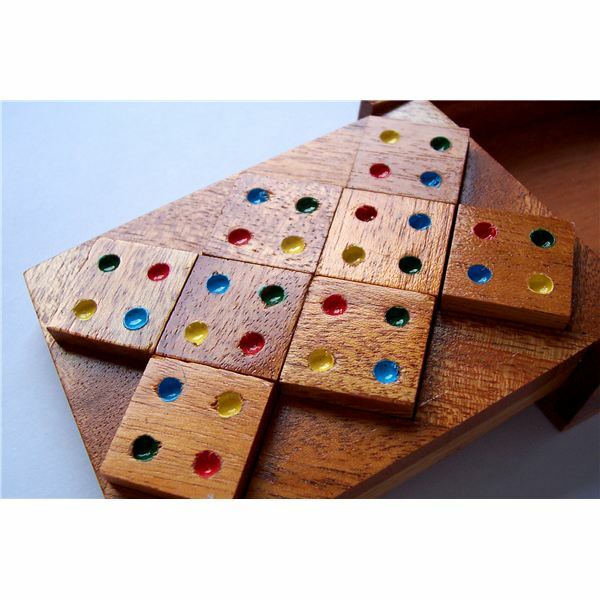 The preschool games domino concept can be adapted to other matching activities. For instance – if you are using farm animals as a theme make a set of “domino” cards with pictures of animals on each part. Ask the children to find and match the same animals. This idea can be replicated in many different forms.